WASHINGTON – The United States Mint announced today that it has released the first ever circulating coins with West Point mint marks. Throughout the remainder of the year, two million each of the scheduled 2019 America the Beautiful Quarters® will be minted at West Point. The first of these coins bearing W mint marks were mixed in with quarters produced at Philadelphia and Denver and shipped on April 1. As with all circulating coins, the W mint mark quarters will be distributed to banks and financial institutions by the Federal Reserve. The coins will likely begin to appear in circulation within four to six weeks. The announcement of the W mint mark quarters coincides with the 227th anniversary of the United States Mint on April 2 and kicks off a program designed to spark a renewed interest in coin collecting. The release also ties in with the American Numismatic Association’s National Coin Week (April 21-27) and parallels a separate initiative that organizers have dubbed “the Great American Coin Hunt.” The coin hunt is a hobby-promoting event sponsored by participating coin dealers across the nation, who have publicly announced plans to place some of their own collectible coins into circulation by using them in commercial transactions during National Coin Week. The America the Beautiful Quarters to be released in 2019 will honor Lowell National Historic Park (Massachusetts), American Memorial Park (Commonwealth of the Northern Marianas Islands), War in the Pacific National Historic Park (Guam), San Antonio Mission National Historical Park (Texas), and the Frank Church River of No Return Wilderness (Idaho). 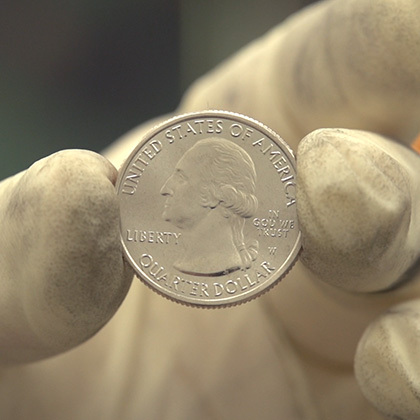 Beyond the ten million W mint mark quarters, the Mint will produce additional coins as usual at the Philadelphia and Denver Mint facilities to meet the demands of commerce. The Mint last year produced 1.85 billion quarters for circulation, ranging from 289.6 million to 439.8 million across the five 2018 issues. To learn more about the W Mint mark quarter, please visit the U.S. Mint website at https://www.usmint.gov/news/inside-the-mint/mint-releases-first-ever-w-quarters-into-circulation. Visit https://www.usmint.gov/about/ for information about the United States Mint.